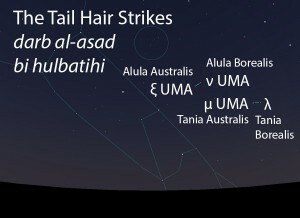 The Tail Hair Strikes are part of the Arabian megaconstellation of the Lion (al-asad). 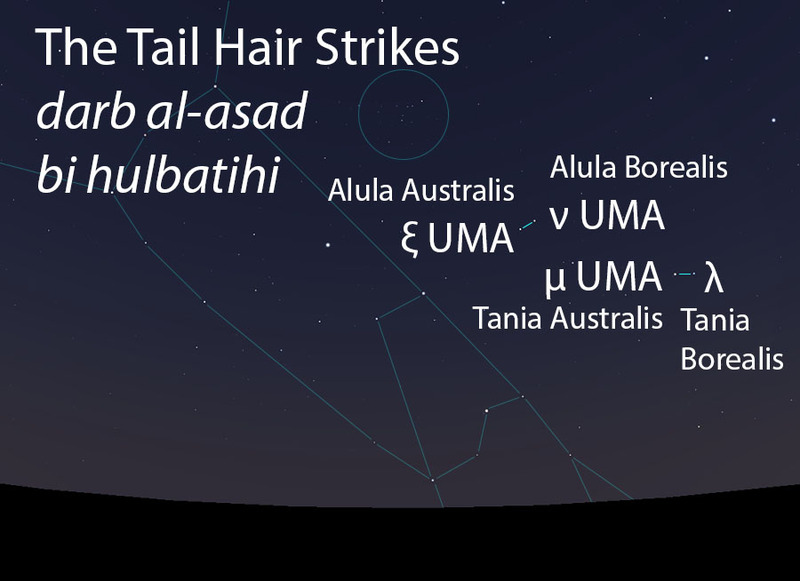 These stars mark the places where the coarse Tail Hair (al-hulba) of the Lion hit the ground as it was running. The Tail Hair Strikes (darb al-asad bi hulbatihi) as they appear in the west about 45 minutes before sunrise in early March. Sky simulations made with Stellarium. Two pairs of moderately bright stars, each pair containing stars that are very close to the other. The Tail Hair Strikes of the Lion do not figure in the calendar of the rains stars. The Tail Hair Strikes of the Lion are not one of the lunar stations. The Tail Hair Strikes are part of the Lion (al-asad, الأسد) folkloric celestial complex, which extends from the Two Forearms (adh-dhira’an, الذراعان) to the Two Shanks (as-saqan, الساقان).